Our city asked homeowners to conserve water. To that end, I purchased the best soil moisture meter. This inexpensive instrument allows me to see when it’s time to water the grass. In this way, we keep the lawn stays healthy, and I’m doing my part to help the community. I can use the same meter to check the ground in my garden, too. This attribute makes it even more useful since some vegetables require more water than others. And if I can’t locate the sensor, I know that my wife has borrowed it to check the houseplants. Although there are many soil moisture meters on the market, I chose a simple design from Dr. Meter. 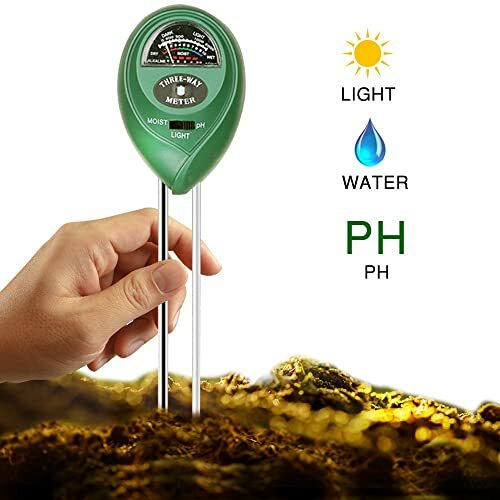 Best Soil Moisture Meter Reviews. 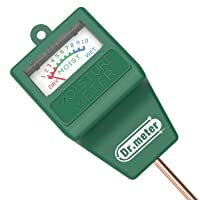 Dr.Meter’s Soil Moisture Sensor is a simple tool that you can use in a variety of places. It doesn’t require electricity or batteries to operate. And the readout at the top is color-coded, making it very straightforward to read. The probe end extends about 10 inches into the ground. That’s deep enough to get an accurate reading of the amount of moisture in the lawn. But you don’t need to insert its full length if you’re putting it into a potted plant. One fact to keep in mind is that Dr. Meter’s soil moisture meter is not designed to remain in the ground. You’ll want to take a reading, then remove it and wipe off any dirt or water clinging to it. Otherwise, the sensor will deteriorate. Although the Dr. Meter sensor is working quite well for me, you might prefer an instrument that measures more than soil moisture. Like the Dr. Meter sensor, the Covery 3-in-1 can test for the amount of moisture in your soil. But it can also tell you the pH level as well as the amount of light arriving at that place on your lawn. It’s a comprehensive tool that will give you help a helping hand in your garden. You won’t need batteries or electricity to operate the Covery soil tester. It comes ready to use. Insert about 4 inches into the ground, and then wait about 10 minutes for the results to appear. After you’ve seen the reading, remove the tool and wipe down the probes. Just like the meter described above, this one also cannot be left for long periods in the ground. The manufacturer offers an 18-month warranty. If you have a problem, they can send a replacement or give you a refund. The only downside to this product is that the display is cramped and small. You’ll need to get up close to decipher the pH level, the moisture range, and the amount of light. My final pick for soil moisture meter isn’t designed to test lawns. 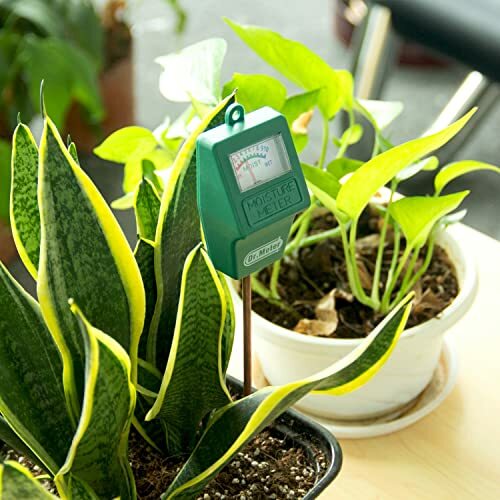 But you can use it to check plants, although its best use may be to track down excess humidity in your home. 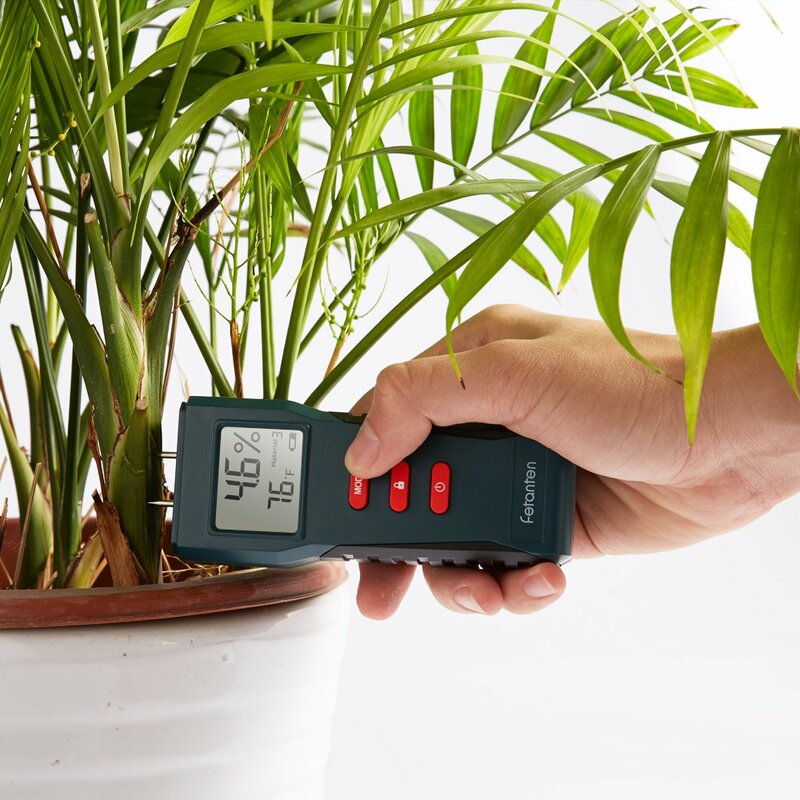 Fetanten’s TS006 is a useful tool if you’re concerned about high humidity levels in your home. You can use it to probe walls, carpets, sub-flooring, and even houseplants. It has two short sensor pins that you will need to stick to the surface where you want to take a reading. Besides moisture levels, the LCD display also reveals ambient temperature in either Celsius or Fahrenheit. To operate the TS006, you will need a 9 V battery that isn’t included in the box. Fortunately, the device will warn you when the battery is getting low on charge. And, just a side note, to get the most out of this sensor, you’ll want to read the manual. This is because you’ll need to change the mode according to the material you’re measuring. For example, while mode one is appropriate for detecting moisture in wood, mode six is what you need to test brick. In conclusion, the TS006 may not help you with watering the grass, but it can help you manage other problems with moisture. And it comes with a one-year warranty. When I began shopping for devices to test the amount of moisture in my soil, I had to choose which features were the most important to me. Although there are many meters available for sale, I was most interested in simplicity. As you can see with my choice of Dr.Meter’s soil moisture meter, I chose one of the most straightforward tools available. Meanwhile, you may prefer a device that can give you information beyond moisture levels, like the ones from Covery and Fentanten. The Dr.Meter soil moisture meter has helped me use less water for irrigating, but maintain my lawn in a healthy condition. It’s very easy to use and does exactly what I needed to do. I hope this review has given you food for thought. It’s never a bad idea to conserve water since it also saves money in the long run.